Description: Got here too late to catch shot number one. So here is shot number two. Description: CSX Q62128 headed northbound. Description: CSX Q62128 crosses the Black River. Description: Canadian Cab On The Lead! Description: CN 256 heads wouth towards Detroit. Description: NB grain empty G81171-26 with new CN covered hoppers with NOKL reporting marks, passing the depot in Hammond, LA. Description: NB grain empty G81171-26. Description: Westbound freight passing the Bellevue elevator. Description: Two CN motors are on the WC transfer this morning. They have yarded their interchange cars for the BN, and now are drifting back down to the T yard where there pickup is. Description: Josh gives us a wave as the WC shoves down the wye so it can make their pickups and head home. Description: Done setting out their MNNR cut, the WC can now head down to Humboldt and Northtown. Description: Helping the plow move along. 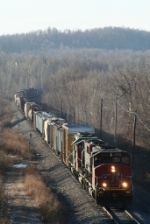 Description: CN 5636 heads for the bluffs. Description: CN 5636 west heads for the bluffs.